Novigo uses Azure SQL, MS Data factory, Azure ML Studio (Python & R) and Power BI to empower our analytics engine. Novigo offers Analytics and Business Intelligence solutions which are industry focused and driven to enhance the ROI. Data is the core of all business operations; a focused and structured data can create multifarious business use cases. Our expert team and the inhouse product iced with custom modelling and visualization provides best in class business insight to keep up with the competition. We have a proven track record of successfully implementing effective business intelligence solutions including new system development and existing system enhancements. Our team of experts provide business driven solutions that transforms corporate data into well-designed information portals, providing decision makers with the ultimate competitive advantage. 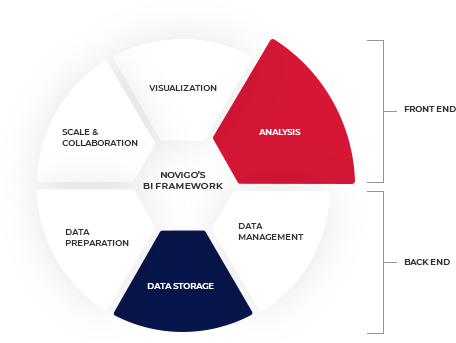 Novigo BI framework is a flexible and customizable business intelligence & data visualization platform that includes integrated dashboards, data analytics and reporting tools. It provides users the ability to create interactive, customizable dashboards, build their own reports, run ad-hoc queries and analyse and drill-down into their data, allowing users to connect and integrate with any data source in real-time on any devices. 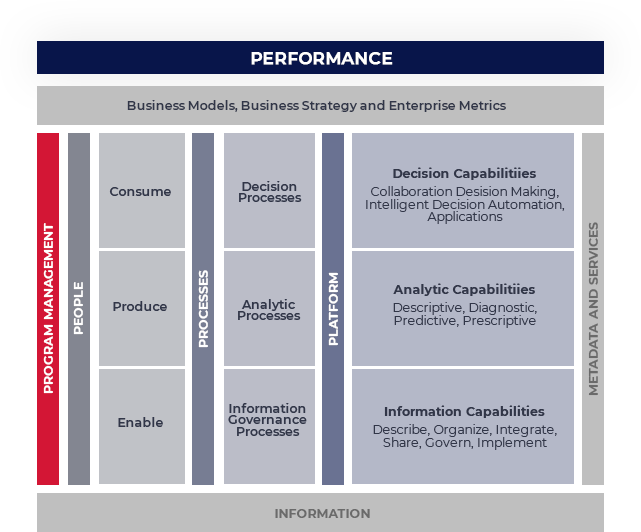 This framework defines the people, processes and platforms that needs to be integrated and aligned to take a more strategic approach to Business Intelligence (BI), Analytics and Performance Management (PM) initiatives.